By George Wilson: If Sam Eggington (23-4, 15 KOs) wins his fight this Saturday night against Hassan Mwakinyo (11-2, 7 KOs), we could be seeing him and former lightweight world champion Brandon Rios (34-4-1, 25 KOs) doing battle on the September 22 undercard of Anthony Joshua vs. Alexander Povetkin at Wembley Stadium in London, England. Rios’ trainer Robert Garcia told Esnewsreporting that his next opponent for September 22 will be in action this Saturday night. With Rios fighting on the Joshua-Povetkin card, the most logical opponent for him would be British fighter Eggington. 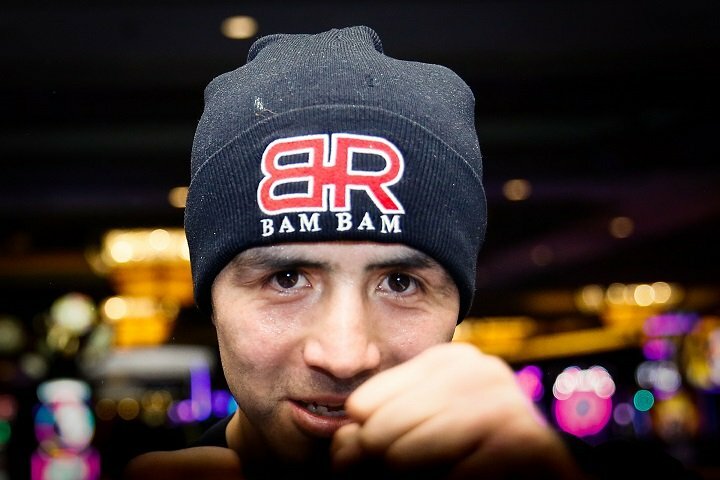 ”I think Brandon is going to fight in London on September 22,” Robert Garcia said to Esnewsreporting. ”They have an opponent, but the opponent has a fight this Saturday. So if everything goes right with Brandon’s opponent this Saturday, he’ll be fighting two weeks later [on September 22,” Garcia said. It’ll be a fast turnaround for Eggington to go from fighting this Saturday against Mwakinyo to getting back in the ring two weeks later to face a tough opponent like Rios. Eggington is young enough to do it, but he’s going to need to get Mwakinyo out of there as fast as possible on Saturday to avoid taking punishment and potentially suffer an injury. There’s a very good chance that the 24-year-old Eggington will easily take care of Hassan Mwakinyo (11-2, 7 KOs) this Saturday to then setup an interesting Eggington-Rios fight for September 22 at Wembley Stadium. The Tanzanian Mwakinyo is meant to be a stay busy fight for Eggington, and not someone that has a realistic chance of beating him. A fight between Rios, 32, and former welterweight champion Victor Ortiz was in the works, but the fight fell through after Victor had some problems, according to Robert Garcia. Rios is now looking to fight on September 22, but he needs to wait and see what happens with his potential opponent with his fight this Saturday. Rios is coming off of a 9th round knockout loss to Danny Garcia on February 17. Rios walked into a big right hand in the 9th round that knocked him flat on his back. Referee Kenny Bayless stopped the fight immediately after seeing how hurt Rios was. The loss for Rios was his second in his last three fights. He was beaten by Timothy Bradley by a 9th round knockout in November 2015. Rios came back from that loss to defeat journeyman Aaron Herrera by a 7th round knockout in June 2017. Rios looked good in that fight. Eggington, 5’11”, would have a big size and youth advantage over the 5’9” Rios if the fight comes off. Rios is 32-years-old and he’s not the fighter that he once was six years ago. However, even in Rios’s prime, he was a flawed fighter, who lost to the likes of Mike Alvarado and Manny Pacquiao. The former Top Rank promoted Rios got lucky in fights against Diego Chaves and Richard Abril in dodging losses. Rios could have easily lost both of those fights. Both of those fights ended in controversy. Eggington has suffered defeats at the hands of Bradley Skeete and Mohamed Mimoune in losing 12 round decisions. In both fights, Eggington’s high volume punch output was neutralized by the boxing skills of Skeete and Mimoune. Those fighters never allowed Eggington to get his shots off with the movement and jabbing they were doing. Rios would seem to be made to order for a fighter like Eggington. Rios stands directly in front of his opponents and looks to bang them out with slow shots. Eggington won’t have to go looking for Rios on September 22 because he’ll be there right in front of him the entire fight. Rios has the better inside fighting skills, but Eggington is bigger, younger and he throws a lot more punches.